I took a week's holiday last week, campervanning around Scotland - nice thanks - and came back to news that BlackBerry is getting into the enterprise smartglasses game. All still quiet on the wearable tech front, I thought. But as a few of the gang have pointed out, this could be a big couple of weeks. Over the past seven days or so, we've seen a lot of action from Google and its partners specifically, so I wanted to talk about the big G's hardware and platforms. 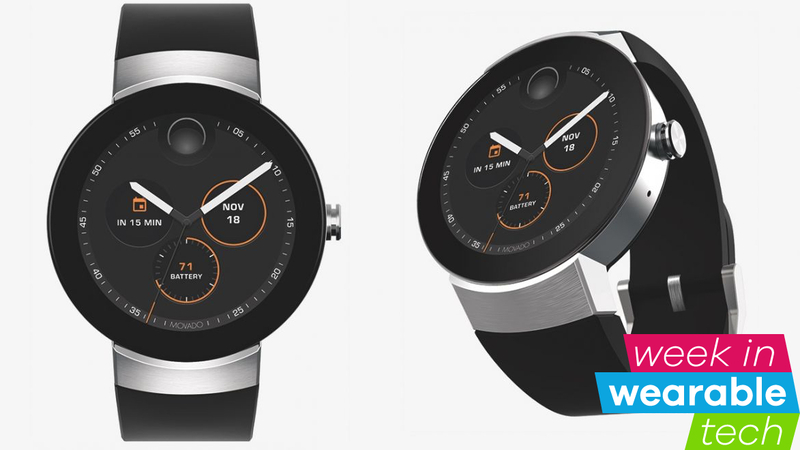 First up, the Movado Connect, a $595 Android Wear 2.0 smartwatch, has just gone on sale. It has Android Pay and specially designed watch faces but it's not so much interesting in itself as a part of what's coming. The next AW splash from watch and fashion brands should be the Emporio Armani Connected in September with Michael Kors and more Fossil Group brands following swiftly behind. Plus on the Movado, don't forget that Hugo Boss and Tommy Hilfiger are also in the Android Wear game now too. It's fair to say Google isn't ahead in sales for any connected-self category - as far as estimates tell us. Apple beats it in smartwatches, Amazon in smart home and, it's hard to judge how much of Cardboard's mobile VR success has been down to strict 'sales'. It's also not all unicorns and rainbows in the news - Misfit's AW watch won't have GPS, some users have had Google Assistant problems - but it's still one of the most interesting companies in this space, as evidenced by a few smaller stories this week. So Google is one-upping Echo by adding voice calls to its Home smart speaker, rolling out to the US and Canada. It's just launched its first 360 series for Daydream VR with Vogue - looking into the wardrobes of supermodels like Kendall Jenner. Plus, the Design Museum just reminded me that Levi's Commuter Trucker Jacket, with Google's Project Jacquard technology, is due this fall - it named the smart clothing one of its Designs of the Year nominees alongside Pilot's translation hearable and a Yvés Behar smart crib. Mountain View could still end up on top in the ambient computing race. The road to wearable tech success is never smooth, and this week we had some news from a couple of companies who have found this out the hard way. Good ol' Jawbone is showing some signs of life. A leaked doc gave us some clues as to the scale of Jawbone Health Hub's ambitions in medical health tech. CEO Hosain Rahman has planned to evolve consumer-grade health and fitness trackers to medical-grade trackers since around October 2016. These gadgets and systems would be capable of delaying, improving and even reversing diseases like diabetes and hypertension, according to Rahman's leaked plans. Jawbone reborn could sell heart attack-sensing bracelets and stress management wearables. We have no idea of the timeline of achieving any of this or whether Jawbone is better placed than Fitbit, already in talks with insurers and the NHS - or even Nokia/Withings - to be the go-to name in sophisticated health trackers. So Jawbone is doing things differently after a rough couple of years. Another plucky wearable tech startup, with good ideas, is BSX Athletics, which has run into a spot of bother over its LVL hydration monitoring wearable Kickstarter campaign. As Mike argues in this week's #Trending column, while it's not surprising that the ambitious project has hit delays in design, it's still not OK that $1 million worth of backers are facing a year-long delay after already waiting months. The only positive is that Samsung is investing in the project, so that at least increases the chances of it becoming a reality one day. One more (positive) thing to take from Jawbone and LVL - tech startups and established companies taking the big questions of health more seriously and not just focusing on convenience concepts aimed exclusively as Silicon Valley bros like themselves. More please. Less actually. The line-up for this year's show is really shaping up, though. This week we got some fresh images of Samsung's upcoming Gear Fit2 Pro (above) - check out Mike's wish list of features for this swim tracking, GPS-rocking, offline-Spotify-playing super fitness band. Fitbit pushed Garmin off our top tracker list earlier this year but with this new Samsung, it could have some new competition. With IFA - which starts on 30 August, in terms of press conferences - the Fitbit smartwatch and (probably) an Apple Watch Series 3, the next four weeks could be more influential in terms of where wearables are headed than the last eight months combined. Phew?